You know it. That first moment you discover a flavor combination so unimaginably perfect that you simply must have it again and again and again. Such was the case with peanut butter and basil for me. Since then, I’ve been cramming the duo into dishes and desserts like there’s no tomorrow. My new obsession is more of a trio: Peanut butter, sweet potato + cilantro. Being that I’m such a huge lover of Thai food – John and I eat it most weeks – it seemed natural to fuse it into other types of cuisines and foods I love. One such food is sweet potatoes. They’re so versatile in both sweet and savory settings, and I could eat one every day and never tire of them. So it was only a matter of time before I slapped vegetables and peanut sauce on them and called it a meal. Plus, I loved the Mexican-inspired version so much I had to recreate it again. 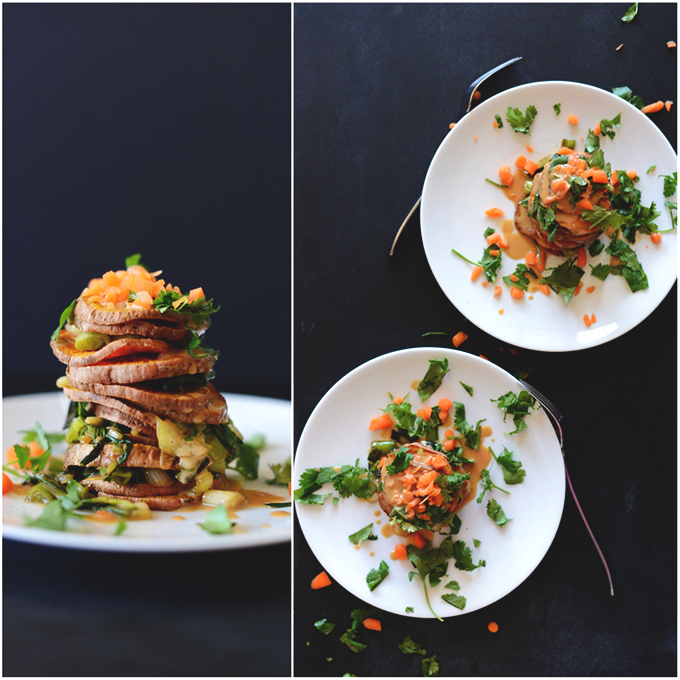 The concept for this dish is simple: roasted sweet potato rounds, sauteed greens with soy sauce + garlic, peanut sauce, fresh carrots + cilantro all stacked together in one Thai-inspired dish. Perfect for lunch, a snack or a light dinner. These would even make a great small bite preceding a bigger meal. Oh the possibilities. 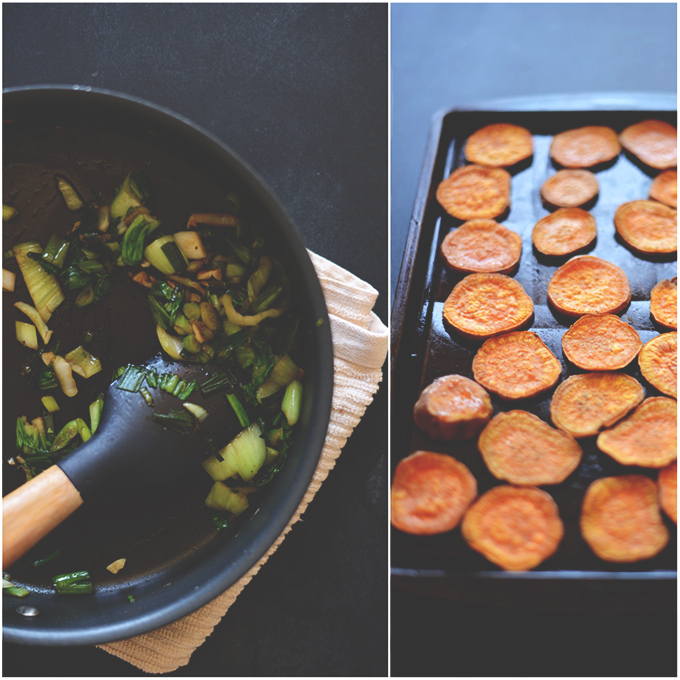 The sweet potatoes are perfectly complemented by the crunchy greens. The carrots and cilantro add a fresh, flavorful crunch. And the peanut sauce is the liquid gold that holds it all together. The only way it could be improved is by adding some sriracha over top, which I highly highly recommend. Peanut sauce and sriracha were meant to be together, I’m telling you. 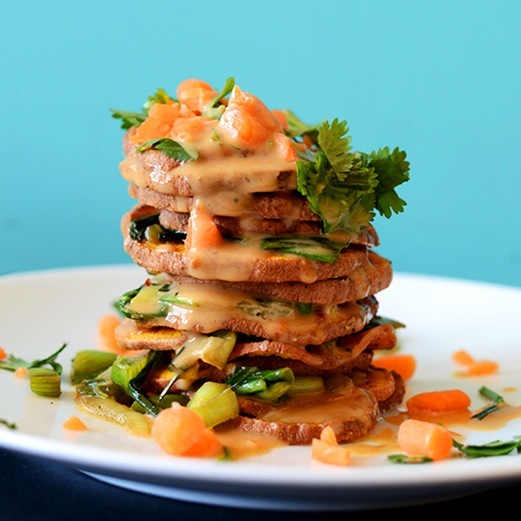 A sweet and savory vegan dish with sweet potatoes, sauteed greens, and peanut sauce. A light, healthy dish to serve as an appetizer or entrée. Preheat oven to 350 degrees F (176 C) and lightly spray a baking sheet with non-stick spray or brush with oil. Add sweet potatoes and toss with half of sesame oil (1 Tbsp as original recipe is written // adjust if altering batch size). Line in a single layer and cook for 20-25 minutes or until softened and slightly browned. In the meantime, prepare peanut sauce (follow link for instructions), and saute garlic, green onions and baby bok choy in remaining sesame oil + the soy sauce, until soft. Set aside. Once sweet potatoes are ready, remove from oven and begin stacking them with a small amount of vegetables and peanut sauce between each layer. Alternatively, just make a mound of sweet potatoes and top with veggies and sauce “nacho” style. You will have leftover peanut sauce, which keeps covered in the fridge for up to a week. 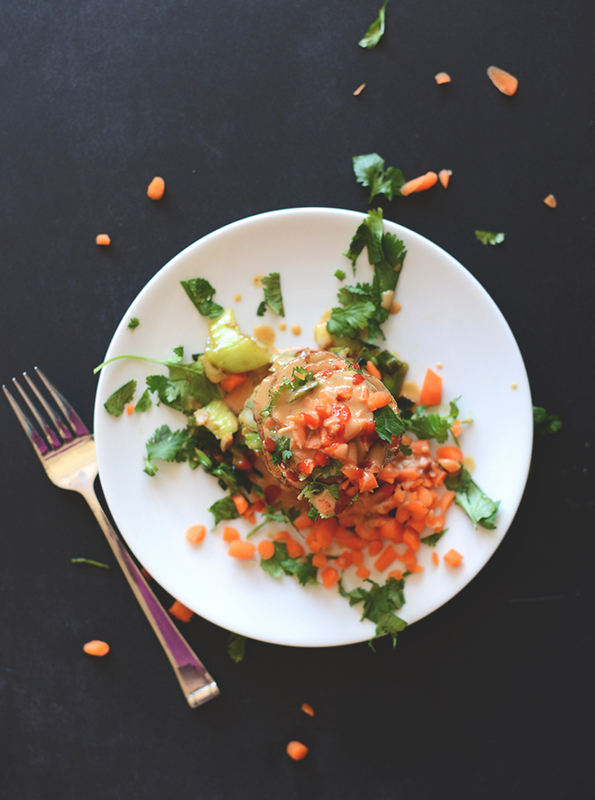 Top with chopped carrots, cilantro, sriracha and enjoy. Reheats nicely the next day. What could I add to this dish to make it a full meal for dinner? Any suggestions? Hi – I just made this for dinner and it was delicious! I made the peanut sauce earlier in the week to use as a salad dressing, so it was ridiculously quick and easy. 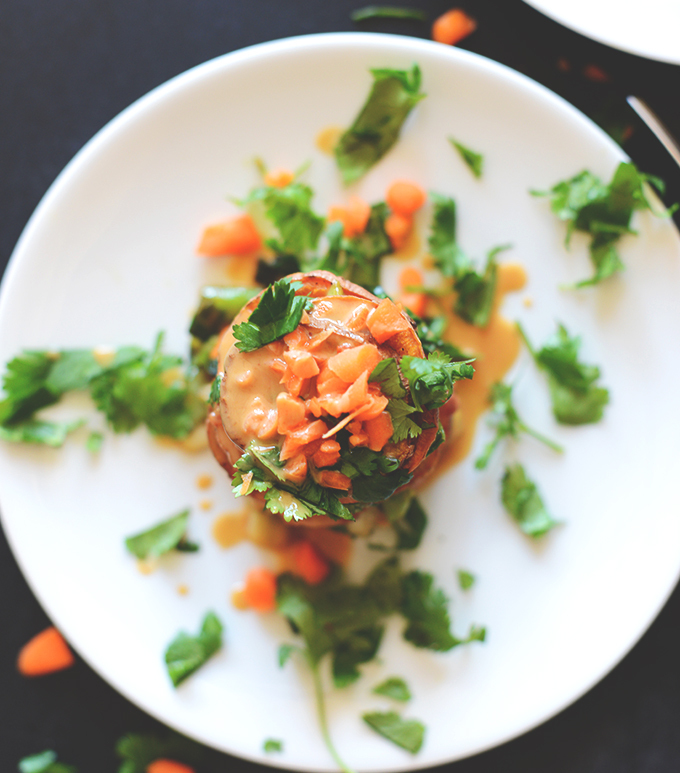 The combination of the sweet potatoes, peanut sauce, and crunchy greens was perfect! My local market didn’t have any bok choy so I used some broccolini instead (which is nothing like bok choy I realize, but it looked fresh and seemed like an interesting alternative). It worked great, but I’m sure it would have been even better if I’d used the bok choy. Thanks for the great recipe. oh my! 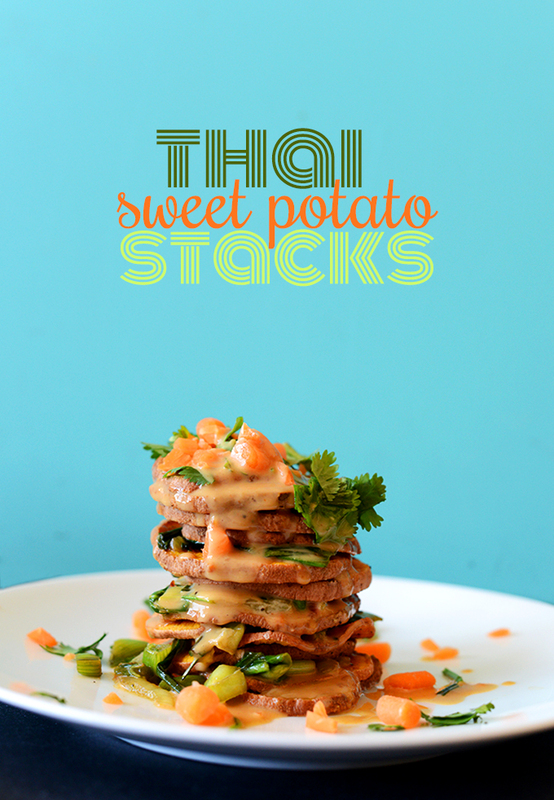 what a beautiful presentation :) I love stacks, sweet potatoes and Thai food so, this recipe is definitely going to into my favorites. ps: I love your recipes! can i have this for breakfast because its making me hungry!!! Amazing! I love everything about this! I am a sweet potato lover also and looking forward to trying this! I love your photography also. Here is another great sweet potato combination (in case you haven’t come across it yet): Sweet potatoes, chipotle peppers in adobo sauce, gorgonzola cheese and cilantro. For less, um, adventurous types, you can do sweet potatoes, barbecue sauce, feta and cilantro. I usually mash the sweet potatoes with the sauce and make a sort of casserole with it. I’m thinking those little fried onions would make a good topping – it seems to need a crunch. These sound so good! Peanut and sweet potato, together at last. 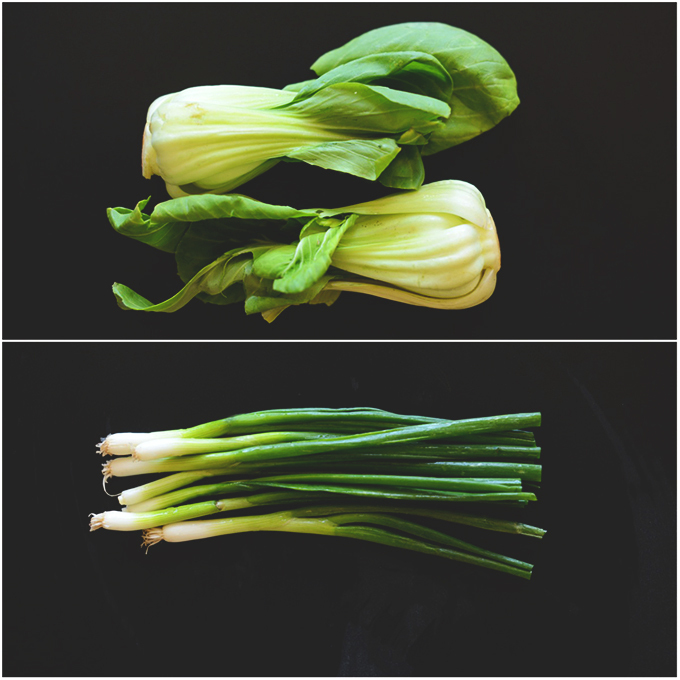 :) I also never know what to do with bok choy besides a simple steam & soy sauce–this sounds like a perfect solution! I am Southern so I am pleased and surprised to see the sweet potato used in something other than a pie or in a casserole. Love the sound of this combination of flavors! Wish I were eating this for lunch! Wow, this is so gorgeous! I adore sweet potatoes so this is right up my alley. And as usual, your photography is gorgeous! I’m with you, I could totally eat sweet potatoes everyday and be completely content. I love your sweet potato recipes! Hopefully I’ll get to try this soon! This food is so dang pretty! And anything with peanut butter, to me, is the business. YUM! YES!! I LOVE this!! I eat thai anything, but this looks killer!! Plus, it is so pretty! I am ALL over this. Love this recipe! Yum. I also just love the colors in the photos. Nice.